O K Wedowee Lake, for the nearby residents of the town of Wedowee, Alabama. Especially those kind folks at Lake Wedowee Life, a rather new magazine, I have the honor of writing a fishing column for each issue. You can simply type in the words, Lake Wedowee Life, to see a link to their online magazine. 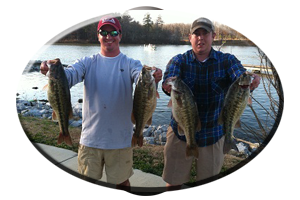 Now, how about some summer bass fishing tips for Lake Harris / Lake Wedowee? For these tips we will refer to this man made impoundment situated in northeast Alabama on the Big and Little Tallapoosa Rivers as, Lake Harris. No matter what you call it, this is Alabama’s youngest man made impoundment, maintained by Alabama Power Company. Constructed by the Alabama Corps of Engineers and impounded in 1983, this rather small lake (about 40 miles in length), may just be the last man made lake to be built in Alabama. Schooling activity is evident throughout the summer months. Schools of Tallapoosa River spotted bass mixed in with some hefty largemouth bass can erupt at any time, as they come to the waters surface and herd up the baitfish schools. Shad, bream and small minnows are their targets. So lures that simulate, or look like, small shad or baitfish helps an angler fool the often skittish, cautious and very weary bass in Lake Harris during these summertime clear water situations. Some of today’s new, over sized swim baits closely resemble bream, small rock bass, red eared sunfish, big threadfin shad or gizzard shad. They are big lures that look like one pounders. No matter how intimidating these big oversized meals look, all sizes of swim baits should be applied on each outing. Try smaller 4-6 inch swim baits on 12-15 pound test line. Bigger swim baits, those come in lengths of 8-16 inches, you should always use at least 17-20 pound test monofilament line. Or some anglers prefer to use braided line in the 30 pound plus class. On Lake Harris try Fluorocarbon line Like ” Berkeley Vanish “‘ that does virtually vanish with clear water clarity. Although many anglers have heard of these type of lures many still fail to even give them a try. Some anglers do not even own a jigging spoon. Of those anglers that do know, many often keep it a secret, or they just stay tight lipped about their jigging spoon results! 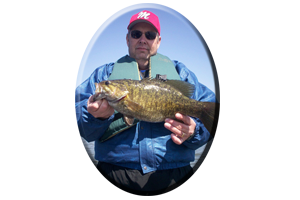 Not only are jigging spoons one of the best summertime lures (and excellent wintertime lures), to aid an angler in finding isolated bass, they also locate big schools of bass and often spoons can trigger these otherwise dormant bass, into striking. Spoons also fool some of Lake Harris so noted, ” monster size bass “, those huge, trophy-sized largemouth bass exceeding, that still hard to conquer – ten pound plus mark. To have any hope of fooling a really big bass while utilizing jigging spoons you need to use strong heavy class rods in 6-7 foot lengths. A good, wide spooled reel rigged up with 17-20 pound test line is suggested. Hooks should be really sharp like Gamakatsu’s # 4 treble hooks or you can change your hooks to Excalibur’s # 4 thin wire, rotating treble hooks. Gamakatsu’s are strong hooks with a tempered bend and they rarely open up, especially with a big bass, or when hung on bottom. So you can really horse these big bass back to the boat fast with these hooks. But Gamakatsu’s are hard to retrieve after getting your spoons hung up on some of Lake Harris standing timber and stumps left here during impoundment. Changing to Excalibur’s light wire hooks saves more lures when getting hung up. Upon getting hung on bottom (if your plug knocker fails to work), try a slow, steady pull with the use of strong line. This will slowly open up a thin wire hook and help you save money on lost lures. Spoons are still cheap at $ 2.00 or more each so stock up prior to your trip, for you will lose some in a days time . * Strike King and Cordell both make quality jigging spoons in all weights. Have some 1/4 ounce spoons and some 5/8 to 3/4 ounce sizes for both jigging in 5-15 feet of water, to very deep water of 20 feet or more with heavier spoons. For schooling bass you should always have a crankbait tied on. To be specific try rigging several rods. One with a shallow running crankbait, another with a mid running crankbait and two rods rigged with deep divers. On one of your longer rods, rigged with 10-12 pound test line, tie on a small bodied deep diving crankbait. Excalibur’s Fat Free Shad are excellent choices. You need to have both a small bodied deep diver and a big profiled deep diving crankbait tied on two rods. So rig another long rod with a big, deep diving crankbait. Try light line of 10-12 pound test to get these deep divers down deep. Make long casts and set the hook hard several times when strikes occur. * Rattling lipless lures are often just referred to as ” Rattletraps ” after the name sake Bill Lewis created. Cotton Cordell has Rattling Spots. Other lure companies have all created a slim line model of their own and they all come in sizes of 1/4 ounce to one ounce, or even bigger. These lures are great for fooling schooling bass. They can be fast reeled just under the waters surface waking these lures to look like a fleeing baitfish. Or you can lift and drop rattle traps and other lipless lures right through the schools of suspended bass in mid depths. Rattletraps are just like jigging spoons, they also pick off the bigger bass holding on or near the lakes bottom. When dropped to the lakes bottom and slowly lift up and down, they simulate an injured looking meal upon retrieve. These type of lures could not go without being mentioned, when referring to Lake Harris schooling bass. 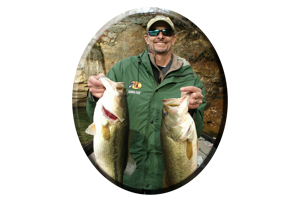 Big spotted bass and often some very big largemouth bass will come from the depths to attack a well placed and well maneuvered topwater lure. This is a type of topwater lure that gets the strikes when bass are feeding on top. The better you learn to ” walk the dog ” with these type of lures, the better you get and the more strikes the lure produces. Zara Spooks have been around a long time with more than a dozen models, ranging from very small size spooks to oversized Magnum sized zara spooks. Two of my favorites for Lake Harris are the “Jimmy Houston Signature Series ” (Bleeding shad color – labled JHBS), Zara Super Spook, featuring 3 hooks and rattles. There is a smaller version called, ” the baby super spook ” featuring 2 hooks. 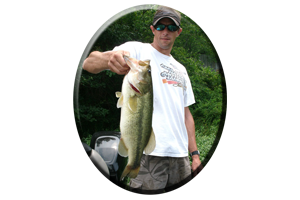 * Other topwater lures (or sub-surface lures) that are good for these surfacing bass in open water situations this summer season are; single and double blade prop-baits, popping type topwater lures, and even spinnerbaits, soft jerkbaits, hard bodied floating and suspending jerkbaits. * Now that’s at least 4-5 rods rigged and ready for finding bass holding at all depths under these schools of baitfish. Some bass are right under these baitfish schools and others are deeper picking off dying or injured shad. 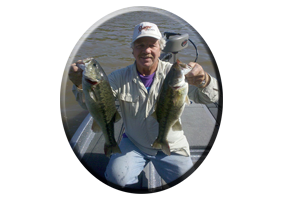 A long cast far past these schooling bass can have your lure ten feet deep or deeper when it is right under this surfacing activity. And often some lures end up right in the face of a big old suspended bass, one that may ignoring other lures!